"My grandmother called them Merry Christmas Cookies. 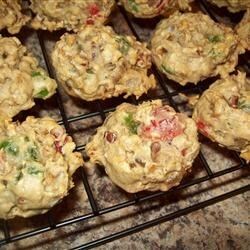 This recipe is her own take on fruitcake cookies." Preheat oven to 300 degrees F (150 degrees C). Grease several baking sheets. Sift together the flour, cinnamon, and baking soda in a bowl; set aside. Beat together the butter and brown sugar in a large mixing bowl until fluffy, about 5 minutes. Beat in the eggs, one at a time. Gradually beat the flour mixture into the butter mixture, alternating each addition with about 2 tablespoons of milk until all the milk is incorporated and the dough is soft. Beat in the sherry, and mix in the nuts, raisins, dates, pineapple, and cherries until thoroughly mixed. Drop the dough by rounded teaspoons onto the prepared baking sheets. Bake in the preheated oven until the cookies are set and the bottoms are very lightly browned, 20 to 30 minutes. Cool on wire racks. You can substitute regular cream sherry for the vanilla sherry. Great recipe, instead of using vanilla cream sherry I used Riesling that I had in the fridge and I also added some vanilla flavoring! They turned out great!!! These cookies were so good I could hardly stop eating them! I will make these again and again!